The weather in the northeastern US finally started to get warm over the past week or two, and it finally feels like summer might come this year. And summertime, of course, means it's time to break out some trusty pasta salad recipes. Today's recipe will provide you with a light and nutritious meal that's simply perfect for a hot summer day. 1) Combine the chickpeas, olive oil, lemon juice, parsley, oregano and black pepper in a large bowl. Marinate at room temperature for about 1 hour. 2) Cook the pasta until al dente. 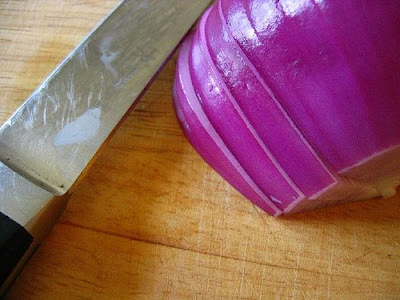 While the pasta is cooking, chop the tomatoes, celery and red onion. 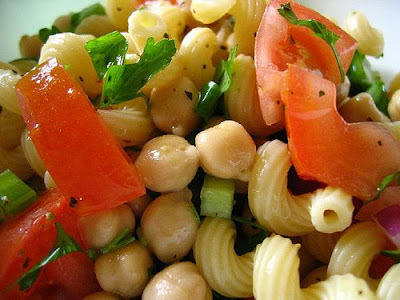 When the pasta is done, add it and everything else in with the marinated chickpeas. Toss and serve immediately. 1) The original version of this recipe called for tubetti, which is a tubular-shaped pasta like ditalini, only longer (ditalini is the kind of pasta you typically find in a minestrone soup). 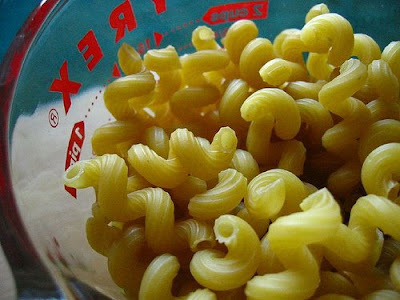 Of course we couldn't find tubetti, or anything close, in our grocery store that day, so we just picked the coolest looking pasta they had--cavatappi. But the bottom line is you can choose any of a wide variety of pasta shapes for this salad. Have some fun with it and experiment. 2) Close readers of Casual Kitchen know by now the predictable reasons why we love pasta salads: they're laughably cheap, really easy to make, and very healthy. This particular recipe delivers a balanced mix of protein (from the chickpeas), complex carbohydrates (an efficient source of energy from the pasta), and fiber and antioxidants (from the vegetables and greens) for roughly $1.50 per serving. You can't beat that with a baseball bat. 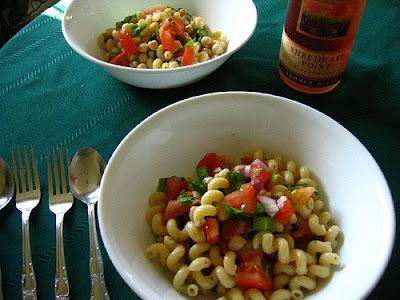 3) There are plenty of pasta salad recipes out there that go for the easy "wow" factor by blasting your palate with a too-strong vinegar or vinaigrette sauce base. In contrast, this recipe is quieter and more modest. With its simple yet elegant mix of lemon, fresh parsley and black pepper, this salad is just perfect. A keeper. I hope you enjoy it as much as we did! Yum-- looks good. I will try it this week. How are you guys? Thanks for the suggestion - it definitely was tasty (and easy & cheap too)! Looking forward to trying other recipes! Thanks for your comment and feedback! I'm glad you enjoyed it.